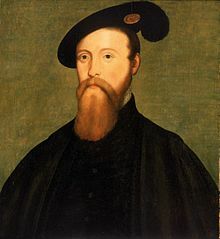 Thomas Seymour, 1st Baron Seymour of Sudeley, KG (c. 1508-20 March 1549) was the brother of the English Queen Jane Seymour (the third wife of King Henry VIII) and uncle to King Edward VI. He was also the fourth husband of Catherine Parr who was the sixth and last wife of Henry VIII. Thomas was the son of Sir John Seymour and Margaret Wentworth. He grew up at Wulfhall in Wiltshire. He was the brother to Edward Seymour, Elizabeth Seymour and Jane Seymour. Henry VIII married Jane Seymour in May 1536, eleven days after he executed his second wife, Anne Boleyn. Thomas and his older brother Edward, both saw their fortunes rise, as they became part of the royal family. King Henry VIII died in January 1547, leaving his son, Edward VI, as King of England. Thomas's older brother Edward Seymour, became Lord Protector of England, in effect, ruler of England as Regent for his nephew, the king. Thomas was very jealous of his brother's power and worked to replace his brother as Lord Protector. In April or May of 1547, Thomas secretly married Henry VIII’s widow- Catherine Parr. As they married so soon after Henry VIII's death, many people turned against them. Upon their marriage, Thomas moved into his wife’s house, where they lived with Henry VIII's youngest daughter- who would later become Elizabeth I. When living in the same house, Thomas had a close relationship with Elizabeth. When his wife Catherine became pregnant in the spring of 1548, she was worried enough about her husband’s relationship with Elizabeth that she sent her away to live elsewhere. In September 1548, Catherine gave birth to a daughter, but died soon after. Upon her death, Catherine left all of her possessions to Thomas, making him one of the richest men in England. Despite the amount of power and money Thomas now had, he was still jealous that his brother was Lord Protector. He began publicly saying that his brother was not good enough at ruling. By 1548, Edward Seymour and others responsible for running the country were becoming aware that Thomas was trying to take power. Thomas would not try to explain himself. On the night of 16 January 1549, Thomas was caught trying to break into the King's apartments at Hampton Court Palace. The next day, he was arrested and sent to the Tower of London. He was found guilty of treason. Thomas was beheaded on 20 March 1549. ↑ Skidmore 2007, pp. 12–19. ↑ 2.0 2.1 Skidmore 2007, pp. 45–50. ↑ Skidmore 2007, pp. 71–87. ↑ Erickson 1983, pp. 65–79. ↑ Skidmore 2007, p. 102–104. Erickson, Carolly (1983). The First Elizabeth. New York: Summit Books. ISBN 0671417460. Skidmore, Chris (2007). Edward VI: the Lost King of England. London: Phoenix. ISBN 9780753823514. This page was last changed on 26 October 2017, at 05:32.